Yerevan Mayor Taron Margaryan visited the political school “Andranik Margaryan” of the Republican Party of Armenia (RPA) to take part in the ceremony of handing graduation certificates to the first graduates of the school. The Vice Chairman of the RPA Armen Ashotyan, the head of the RPA Youth Organization Karen Avagyan and the teachers of the political school took part in the ceremony. Greeting and congratulating the listeners of the school Mayor Taron Margaryan stressed that the activity of the first graduates of the political school “Andranik Margaryan” is inspiring indeed and expressed confidence that the knowledge gained here will contribute to the development and strengthening of the state. 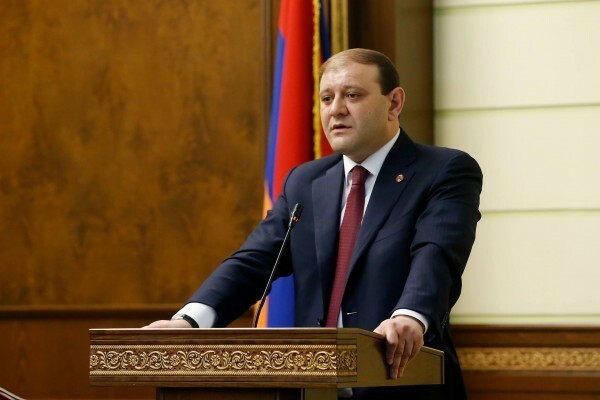 “I assure you that each member of Andranik Margaryan's family feels proud with the fact that Andranik Margaryan's name is uphold both at the party and in socio-political sphere. Andranik Margaryan's activity particularly outstood in the years of Armenia's independence however we shouldn't forget that he started his political activity in the Soviet period, as a member of the National Unified Party. The way passed by Andranik Margaryan together with his co-thinkers was hard. On this way he lost many of his friends and those who stayed alive took part in the foundation of Armenian independence and the RPA. Independent Armenia which was dreamt of by our ancestors is our parents' achievement and was handed down to us so we must together take care of it, cherish it and do our best to preserve it as independence is not easy to achieve. This political school gives the youth a wonderful opportunity to get knowledge in politics and this knowledge will later help them in making decisions aimed at the development and strengthening of the country”, stressed the Mayor of Yerevan. It should be noted that during the ceremony 100 graduates of “Andranik Margaryan” school of politics were handed their graduation certificates by Yerevan Mayor Taron Margaryan, by the RPA Vice Chairman Armen Ashotyan and by the head of the RPA Youth Organization Karen Avagyan.